I've asked the seller to remove my pictures and amend the item description to no avail so could you please report the item. Having built one of these models, this offer is very suspicious. 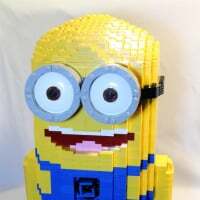 He took the time to collect all the pieces (a very formidable task) but now cannot build it? If those are quart size bags, it doesn't look like near enough parts compared to the tub fulls that I rounded up. Also, it doesn’t stated whether he has the rare parts (like the LBG 8x8 radar [email protected] 25.00 each) which I would do if I were to sell. Honestly, the “Buy-it-Now” price is low. Based on the fact the it has never been built, I would suspect that this listing is short A LOT of parts. On a side note, who did the sticker? Any chance of still getting one of those? Pm me your email add ill send you the sticker file. Cavegod, I'll gladly report the item for you, but can you provide some concrete evidence that these are your pictures? I've had at least one ebay seller use my auction photos before. I both asked the seller to remove them and reported the item to ebay, and neither action did anything. I've also reported other random stuff to ebay, and nothing ever gets done. I think that, unless it makes or saves money for ebay , they're not interested in doing anything. In this case, maybe they will since the auction is probably fraudulent. Just look on my flickr youl see the pics. @cavegod‌ - I Just spent some time communicating with the seller over about 20 messages and convinced him to take the photos down. A bit off topic but relevant and funny. I once had someone copy an ebay listing exactly for a satnav I was selling about 10 years ago. I used photobucket and html to list the item and it was copied exactly, including all the html links. I reported the item but ebay did nothing for a few days. I was annoyed so took my own revenge. I uploaded an image of a condom box to photobucket and changed the pictures from my satnav listing into pictures of condom boxes. I ended my listing early and let his carry on. He had already had some bids and was unable to end or edit his listing. For the next 5 or 6 days he received no more bids on his satnav which looked like a box of condoms. ^Obviously to late, but since the seller has fixed the issue there is no longer a need to report the listing. Well the pics are gone but hes still selling the files with it. @cavegod‌ - Ah, ok. Is that the main problem? He'll have nigh an impossible time trying to sell that thing without directions. He's Selling the pieces. The instructions are free. I think you gotta let that one go. I know for a fact that the instructions are not free, unless @cavegod‌ wants to give them to someone for free. Nor should they be. They represent a ton of work to get them into LDD and should not be profited off of by someone other than the author. The seller should be free to sell the pieces, but not instructions/files. Just my opinion. Did the seller BUY the instructions? If so, he can do whatever the heck he wants to in disposing of them. If he came into them illegally that is a different story. If you don't want someone potentially reselling something you sold, don't sell it in the first place. I contacted the seller as well, figuring it might be worth kicking the tires a bit. I purchased the files from Cavegod awhile back, but as I'm still working on my UCS collection I hadn't started buying parts and thought this could be just the thing. One thing I will mention from talking with the seller is that apparently the rare parts (8 x 8 dishes, large wheels, barrels) are PAINTED to match the other lbg parts. That would certainly account for the price. No I personally wouldn't work with painted parts but as I understand it substitutions can be made for these super rare/expensive parts for a relatively low price. However I believe I'll be holding off on this one. It's just a really bad time of year to try to justify big ticket items for myself...Tis the season! ^ At the very least he should be reported to someone for painting Lego parts. I completely see your point. Just to me, it feels slimy. Using that logic, I could have bought the instructions and then posted them for everyone to have for free. While not really illegal, certainly not very ethical. The seller should sell the pieces and tell the buyer where he can buy the files. Again, just my opinion. @Brew‌ What you are describing is pretty perverse stretch of my logic. The seller no longer has any use for the instructions. He is thus including them in a transaction that has all of the pieces necessary to build the model. They are an essential part of the transaction. He is not attempting to distribute them and profit off of them via eBay auctions just for the instructions. This is no different than selling a used LEGO set complete with instructions. What you are suggesting could actually be an illegal copyright breach at worst and a douchey thing to do at best. I for one hope that @cavegod‌ has made a good sum of money on his instructions and that it gets made into a LEGO set (of course we know that will never happen as the model currently exists for cost purposes). If it does not get made into an official set, I hope he continues to be able to profit on sales of the instructions. It as beautiful model and worth supporting for those that have the means. However, I fully understand the venom that exists on this site when the mere mention of the word "reseller" arises. I'd say if he paid for the original instructions and he's only selling one model with one set of instructions there isn't anything legal wrong with that unless the original sale had some sort of clause that it could not be resold. If he was trying to sell multiple kits or just had the instructions for sale more than once then he is being shady but the legal side of it might be grey area since it is an artistic work like a photograph then there is usually some sort of creator ownership laws but enforcing is always weird. On the other hand selling the instructions as "AT-AT" is probably technically illegal as well since that name is IP probably owned under the Star Wars licensing and probably should have been named generically. Again, I do see your point. And I concede that my example was extreme (something I would never consider doing). I was just trying to say that this is someone's MOC, not a regular Lego set and represents a lot of work. I do feel it's a little 'douchey' to resell someone's MOC files. In the end, if you are going to sell such files, it is something you have to accept I guess. I bought instructions for the Golden Hall of Edoras. I built it and plan to keep it intact, so I no longer need the instructions. I guess can sell them to someone else? Used, so less than full price, of course. I don't remember one of those pesky disclaimers by @KevBrickstruct saying I was only buying a license for the instructions for my personal use. ^ Not a bad price considering the amount of work it is to source all the parts. By the way, can anybody find the thread where we posted all of our various building experiences? I could not locate it this morning. are the ATAT instructions available for purchase? Yeah, I'd buy it just for the parts. It definitely cost me a more than $800 for all the parts. I was going to ask if the instructions and parts list are available for the model. PM @cavegod‌ - he's the designer of the AT-AT and can get you set up with the instructions. It definitely cost me more than $800 for all the parts. I don't know what the legalities are for things like this. I know that this was discussed in full in other threads. @LegoFanTexas‌ was a major contributor in that discussion. A lot of it had to so with selling books overseas. Crumbs you have a good memory. I remember that. I know you jest of course (Klatu003) so no worries ;), but I can understand how CaveGod would feel about this auction, as I've been thru it too,.. and Ebay was not much help in pulling it down. Selling the completed model on Ebay with the instructions is a crap move by anyone…if it's not your design. Unless you create the instructions, or have taken the time to create your own instructions….a seller on Ebay doing this with someone else's work can't possibly begin to respect what kind of blood , sweat , and cost that goes into creating custom instructions/ designs. Especially one the size of the AT AT, or the Golden Hall! After continued discourse with the seller trying to get the pictures down, I decided that now might actually be the time to dive into this project since I might never be able to buy the pieces cheaper (looks like I was fortunately right from comments above). Made him an offer, negotiated for most of the night, and finally got him to concede. Since I've already purchased the instructions from cavegod over a year ago, there's no harm there either. I bought @cavegod's instructions from him. I have not yest amassed everything I need, but plan on it being epic when I do! I highly recommend it!